Michael Ancel is also upset that Rayman Legends was delayed. Protests and boycotts and righteous anger are the order of the day for gamers expressing dissatisfaction with a company. Less common is when the developers decide to do the same thing. Following the postponement of Rayman Legends on the Wii U, the team that developed the game joined fans in asking Ubisoft to release the completed Wii U version ahead of its still-in-development 360 and PS3 counterparts. The dev team now has an unlikely and potentially powerful new ally: Michael Ancel, the man who created Rayman. 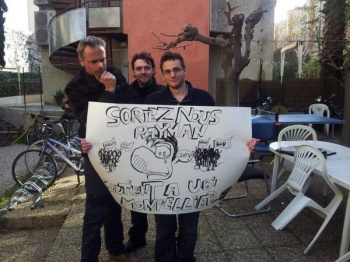 A photograph of Ancel along with two of the two of the Ubisoft Montpellier developers shows him behind a sign depicting a hand-drawn Rayman face in tears. "Relase Rayman," the poster urges (in French, naturally). "Support Ubisoft Montpellier." Rayman himself sports a speech bubble with "Please!" penned in, and finds himself backed by crowds of adoring fans with "Wii U" and "28/02/13" (the game's original release date in charming European style) flags. So far, Ubisoft has promised another Wii U Rayman Legends demo to pacify fans, but with Ancel stepping in, the publisher may have to respond with something a little heftier. Ancel and the Montpellier developers are taking a big risk by standing at odds with their publisher, but they obviously feel strongly about their work releasing in its original timeframe. Whether they succeed, we'll know one way or another by February 28.